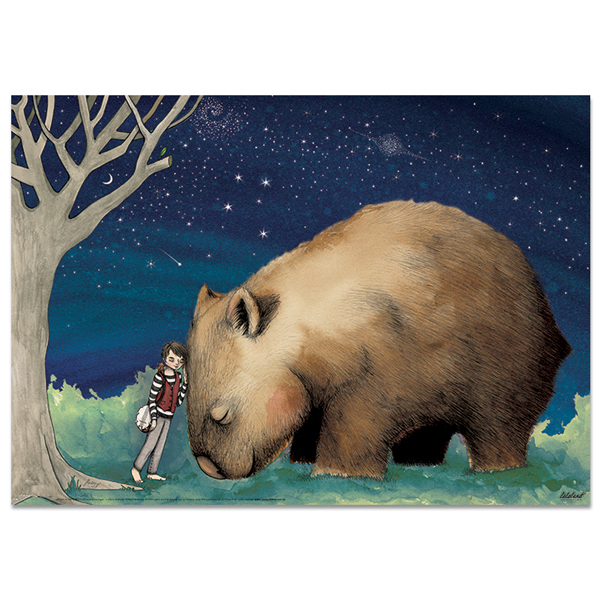 Giant Wombat and Banjo Boy, by Flossy P. This poster is available from Lalaland. The night was quiet, like there was nothing else stirring in the whole world. Eli wriggled his bare toes in the grass. He had his banjo over his shoulder, and he was wearing his favourite striped t-shirt and jeans, with his dad’s vest over the top. He’d been wearing his dad’s vest a lot lately. He waited, leaning against a tree with only one green leaf clinging to a low branch. The moon was the shape of a banana. Eli searched for constellations. His dad had been so good at finding them, but Eli hadn’t inherited that skill. Suddenly, he heard the gentle padding of large footsteps coming his way. Eli turned around to see the wombat, which seemed even larger than it was yesterday, looking at him as it stopped and bowed its head. Eli reached forward to pat it hello, and as his hand brushed its coarse, chocolate-brown coat, he could swear he saw it smile. A moment later, they were both sitting on the grass. Eli was playing his newest song, humming a tune that didn’t have words yet, while the wombat closed its eyes and went to sleep. Eli curled into the warm folds between the wombat’s belly and its right front leg, the music still playing in his mind. He had met the wombat every night this week, since the first day he saw it walk past his bedroom window. He followed it all the way to the park. When it noticed him, it seemed frightened at first, trying to dig a hole to get away. But Eli approached slowly, sat down not-too-close, and started playing. Eventually, the wombat lay down, and in that moment, Eli felt they became friends. The downside of having this friend was that he worried about the wombat all the time. Where did the wombat go during the day? Where could it have a hole big enough to live and sleep in, but not be suspicious to people – people who feared difference, who chose to see it as out of the ordinary, instead of extra-ordinary, because that was safer? Eli woke as the world around him began to brighten with the sun. The stars were gone, but the banana-shaped moon was still visible in the clear blue sky. His shirt was damp from the dewy grass. The wombat was gone, but he could see the giant, flattened patches of grass where it had walked gently, softly, away. A friend once told me that when they were a kid, they would camp out on their grandparents’ farm and sleep under the stars. I still love the way they described that sky, and I can still imagine the kid-version of them lying in a tent with their siblings, talking and laughing with the door unzipped so they could see out. My friend described so perfectly a sky I haven’t seen nearly enough in my life, growing up so close to a big city, in a suburb mapped with streetlights. There were school camps out in the bush, cooking marshmallows on the fire while one of the teachers strummed a guitar and tried to get us all to sing along. There was one camp at Mt Buller, where one night I walked around with another friend after lights-out, treading carefully through the icy sludge that was trying to pass as snow that year. We turned a corner behind a cabin and stopped because the whole world in front of us became that pinprick-sheet of stars. There was a family trip when my brother and I were kids – I can’t remember when or where it was – but we took a night tour into some caves to see the glow worms, and when we emerged, that same sky enveloped us like a majestic dome. I’m sure there have been more occasions when I’ve seen it … or perhaps not. I haven’t seen that friend who used to camp out on their grandparents’ farm for years. 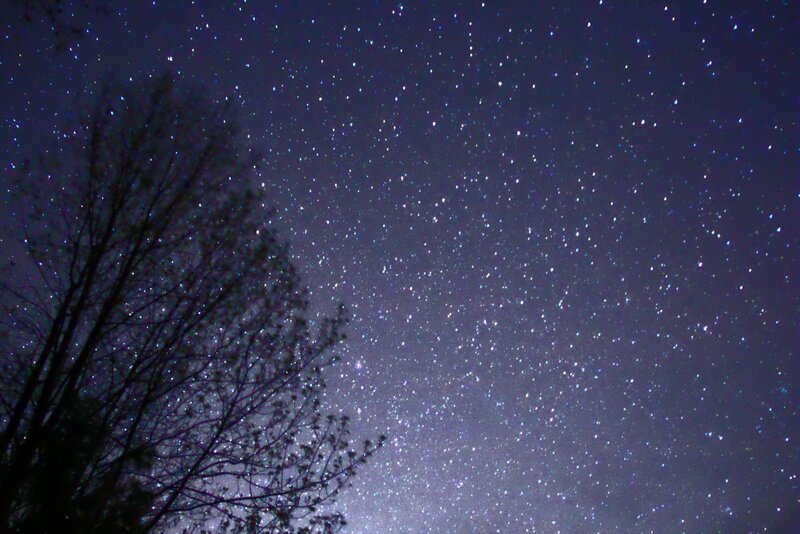 But I can still hear them talking about the stars.